3) Off-street parking on Help St and Brown St. These parking spaces are pre-paid 1-hour parking at a rate of $4.50/ hour. 6) Secure Parking – entry on Endevour Street. 7) Wilson Parking – entry on McIntosh Street. 8) Mandarin Shopping Centre – entry via Victor Street. 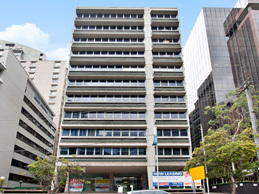 1) Exit the train station, turn LEFT and take the escalators up to RAILWAY STREET (away from Chatswood centre). 2) Cross the road at the traffic lights at the top of the escalators. 3) At the second street, and at the first traffic lights – turn LEFT onto Help Street. (For the Brown St entrance, turn LEFT at the first street). 4) We are on the 9th floor of #10 Help Street. The main entrance to our building is on Help street. However, there is also a side access on Brown street (12 Brown Street – next to Mantra Hotel), which can be more convenient if you have parked on Brown street or are walking from the train station. The Brown street entrance has a wheel chair ramp. For our interstate patients we recommend accommodation at Mantra Hotel Chatswood, which is conveniently located next to our practice on 10 Brown Street.